Bonjour and welcome to Nice! If you have not yet travelled to the French Riviera (known by many as the ‘Côte d’Azur’ or “azure coast”) on the Mediterranean coast of southeastern France, then the city of Nice is the very first stop for you. 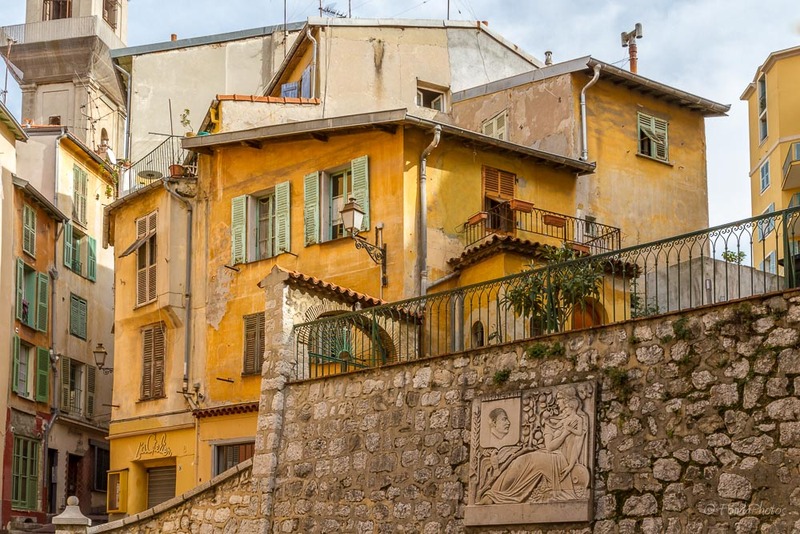 I recommend that first time visitors spend at least one or two nights in Nice – which has enticed visitors with its long seaside promenade, clear air and soft light that have attracted notable artists – including Marc Chagall and Henri Matisse – for centuries. During one of my recent visits to Nice, I started out in the early morning walking the length of the beachfront towards the best lookout over the city. I passed first through Cours Saleya in Nice’s Old Town – enjoying the colors, the aromas, the stalls, the conversations and the people at this famous open-air street market known for its flowers, olives, cheese, vegetables and fruit produced and grown by local farmers. I climbed to the top of the Colline du château (Castle Hill or Castle Park) where at 302 feet, you are treated to a spectacular view of the Promenade des Anglais and Baie des Anges to the West and the Vieux port or Old Port of Nice to the East. It is a stunning view of the blue sparkling Mediterranean Sea during the day and a memorable sunset and twinkling lights of the coastline in the evening. If you do not wish to walk all the way, the elevator will take you to the top in no time or, you may also choose to drive up. Although the original castle dates to the 15-16th century, the park was built in the early 1800s as a leisure spot for the growing number of tourists. It still attracts many visitors – no wonder! I strolled through the peaceful gardens where one can still find remnants of the castle’s ruins, a tower and a belvedere overlooking an artificial waterfall (Cascade Dijon) to cool off on a hot sunny day. And children will be happy to find playgrounds just for them! At my feet below lay the beautiful tall houses of Le Vieux Nice (“Old Nice”), with their tiled rooftops and red, ochre and yellow walls, and that is where I headed next. But first, I found a very decent and tasty fare of local snacks for lunch: Socca (chickpea flour crêpes with a sprinkle of black pepper) to accompany a large Niçoise salad (ripe tomatoes, hard-boiled egg, tuna, anchovies, spring onions and small delicious black olives from Nice with local olive oil) and a slice of Pissaladière (a savory caramelized onion and anchovy pie) with a crisp, refreshing glass of rosé wine. After lunch, I sought shade in the narrow streets below in Le Vieux Nice – with its many restaurants, bars, and small shops. I stopped off at Fenocchio for a lavender ice-cream cone (who could resist!). From there, I headed away from the hustle and bustle to find a bench or some steps for a short rest to savor my morning full of beautiful sights and delicious tastes. Please do not ask me the names of the winding streets I explored, as I like to get lost as I wander through cities and towns. I find that this is the very best way to discover hidden corners, authentic lifestyles and maybe a gem or two that you can keep all to yourself. Travel is always an adventure – and Nice and its Old Town is a wonderful place to begin your adventure in the French Riviera. I hope you will include a stopover on your visit. Sylvia Fondanèche is the France destination specialist for Delfinia Group, a luxury travel group that specializes in arranging tailor-made luxury vacations and honeymoons, villa rentals, and crewed catamaran and motor yacht charters in Greece, France and the Mediterranean. With an extensive background in the hospitality and leisure industries, Sylvia has lived and worked in France for 30 years and calls Paris home. She looks forward to welcoming Delfinia’s clients to Paris and the south of France.